Stallholders at Chichester's Farmers' Market have been recognised for their high quality produce and hard work after the market won Sussex Farmers' Market of the Year at the Sussex Food and Drink Awards 2018. To make their decision, a panel of judges carried out a secret visit to each of the ten shortlisted markets. The award, sponsored by Harveys Brewery, was presented at a glittering ceremony on Wednesday 7 February in Brighton. Each stallholder will have the chance to display the award over the coming weeks. Another award winner on the evening was Bookhams Cheese, a regular attendee at Chichester Farmers' Market. It won the coveted Best Producer of the Year award. During the evening, guests enjoyed a seven course banquet featuring ingredients sourced from across East and West Sussex. "Our stallholders work extremely hard throughout the year to ensure a wonderful range of top quality produce - we are delighted that the market has been recognised with this wonderful award," says Councillor John Connor, Cabinet Member for Environment Services at Chichester District Council. "As well as our excellent producers, this award also recognises all the hard work that goes into organising the market and all those who are up at the crack of dawn setting up the stalls. "On behalf of all the stallholders I would also like to thank all the customers who shop at the market and continue to support local food." Mike Stace, owner of Noble and Stace Chocolatiers says, "I'm so pleased that Aime and the Chichester Farmers Market team have received the recognition they deserve from the Sussex Food & Drink Awards organisers, the judges and of course the customers who support the market. As a small rural business the market is a really important way for me to present my products to potential customers and be able to talk to people about what I do." 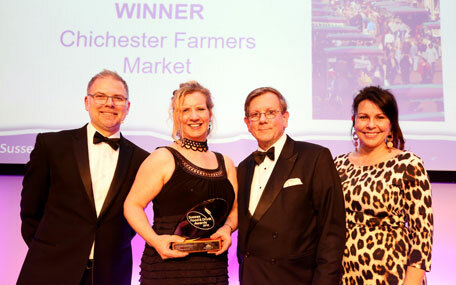 Jennifer Knight, Marketing Officer of Chichester Farmers' Market sponsor, Radian Homes, says, "We're delighted that Chichester Farmers' Market has been crowned Sussex Farmers Market of the year! We're committed to supporting the communities in which we build, and we know the Farmers' Market is an integral part of the community. It really does showcase the very best local products and businesses, and we're thrilled to be able to show our continuing support." Chichester Farmers' Market runs on the first and third Fridays of the month, 9am until 2pm in East Street and West Street. The next Farmers' Market will take place on Friday 16 February. View a video of the awards .